Everyone needs a homemade gingerbread recipe in their collection. 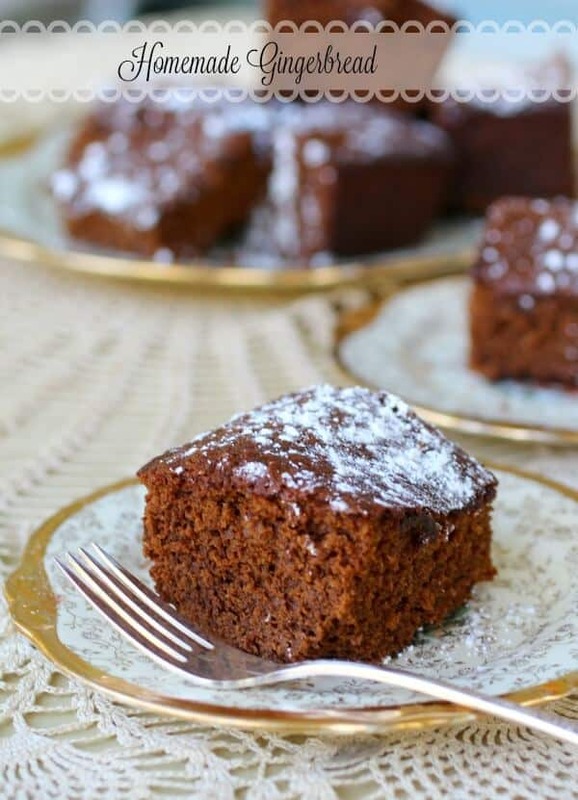 This old-fashioned, spicy, moist cake is super-easy and full of complex flavor but basic enough to handle any topping or sauce you want to put on it. There is nothing quite so indulgent in the fall as a warm square of gingerbread with maybe a swirl of whipped cream on top. OK, a swirl of whipped cream dusted with nutmeg. There. I haven’t made gingerbread in a very long time — and when I say very long I really mean decades. Literally decades. I don’t even know why. I love it so much I could eat it every day. I could go through an entire pan by myself… OH! Now I remember why I don’t make it!!! I don’t know, there’s something about homemade gingerbread that just makes the world right. I associate it with the smell of burning leaves, crisp apples, and bonfires even though only the bonfire is common here. 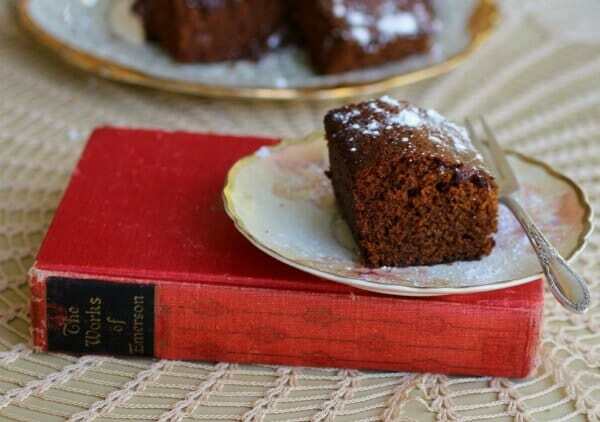 Still, in all of the reading I have done warm gingerbread is served on chilly autumn days so I have Louisa May Alcott and L.M. Montgomery to thank for my preconceived notions about this stuff. I was the only child of older parents and I read a lot. I didn’t connect with kids my age for the most part because I was around adults all the time. My parents were in their 40s when I was born so all of their friends were empty-nesters. I was precocious, had an extensive vocabulary, and other kids were noisy — they scared me. I had just one friend at a time, depending on where we lived. I am still reserved in person, not because I am stuck up I am just painfully shy. Anyway, I spent my time reading and would go through at least a book a day. Sometimes more. About the time I entered fourth grade I discovered Victorian authors of both fiction and nonfiction. Alcott, Whitman, Montgomery, Austen, the Brontes, Hardy, Barrett-Browning, Thoreau… I eagerly devoured everything I could find. By the time I was in seventh grade I had moved on to early 20th century authors and more social commentary and existentialist writings. Oddly enough the Victorian fiction shaped my inner ideas of what was important but the 20th century fiction shaped the protective shell I covered myself in as a teenager. And sorry, that is way off the subject. 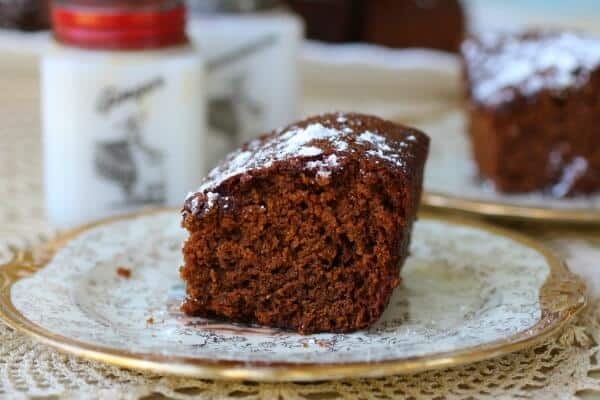 This homemade gingerbread recipe is a little spicier than most because… well, if you’ve known me more than a couple of days you’ll know how much I love my spice! I added cardamom to give it an added layer of orangy-spicy goodness and the coffee just kind of pulls it all together. You’ll understand when you smell it baking! Be sure not to over-bake it because it does dry it out. Check at 35 minutes then check it every 2 or 3 minutes after that. I adapted this recipe from 1975 Farm Journal’s Country Fair Cookbook. I personally don’t consider this vintage but a lot of you will… lol! The following is an affiliate link. If you click through and buy I will get a small commission which is used to help keep the blog up and running. Thank you so much for being a part of Restless Chipotle! If you can’t find roasted cinnamon locally check out the link below. It adds to the unique flavor of this gingerbread recipe but you can substitute regular cinnamon if you like. An old fashioned, homemade gingerbread recipe that will make your house smell like fall. This is a dark, spicy recipe that is wonderful plain or topped with ice cream, whipped cream, or your favorite sauce. Grease a 9x9-inch baking dish and set aside. Sift the flour, baking soda, ginger, cinnamon, cardamom, chipotle, and salt. Add the dry ingredients alternately with the hot coffee, beginning and ending with the dry ingredients. Spoon into the prepared baking dish. Smooth the top and bake for 45 minutes or until done. I really want to try this, but I live in Colorado; do you have high altitude adjustments? I have used that cinnamon before and it is wonderful. Plus it reminded me that t am out ? I adore gingerbread and love the extra spices and flavors you have added. There is nothing better than homemade gingerbread in my book. I love gingerbread, but I rarely make it. I make mine with lemon sauce, but I’d take it any way I can get it! This looks delicious! Love that this recipe can be pretty veganized! 🙂 So I can enjoy one or more slices. Oh yeah! That shouldn’t be a problem at all.. don’t count on being able to stick with just one.. I have actually never made my own gingerbread, this looks like the perfect recipe to try! Perfect for the holidays! Sara you should give it a try! Oh Wow – I have never made my own gingerbread – reading through your ingredient list makes me almost smell this baking – wow – love the extra spice in their – cardamom is one of my favs! I have gotta try this soon! It really does smell good. This looks so incredibly tender and delicious – absolutely GORGEOUS! I too love homemade gingerbread Marye. And have also not made it for decades. I’m so excited to try your recipe, fall is the perfect time for gingerbread! 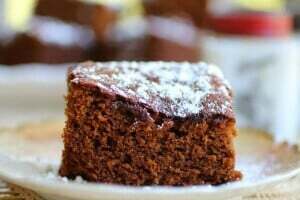 I love soft gingerbread cakes like this. Looks good and it’s almost time for gingerbread here in Philly. Just a little colder and I’ll be there.